2. alkalize your body? Also click here for more info. 3. metabolize within minutes of ingestion? 5. contain all of the 70+ trace minerals in ionic form that you body requires? 6. contain over 20 billion antioxidants in a one day supply? 7. purify or detoxify the water that you drink? If not, you're short changing your body and may be treating it like an old jalopy instead of a brand new Mercedes. How can you tell? There can be a lot more benefit to taking calcium supplements than simply correcting a calcium deficiency. If your coral calcium supplement is a capsule or a caplet or tablet in any form or a liquid, you're only getting a small percentage of the benefits you could be getting and for about the same amount of money. If you're not using Sango Coral Calcium Supplement by Nature's Gift™ in the sachet (tea bag) form, you're cheating your body. Read on to see the importance of the seven questions asked above and to see how Sango Coral Calcium Supplement will keep your body younger and healthier than any of the other calcium supplements. It's true that supplements don't cure disease. However, it's also true that with the correct supplements you may not contract disease in the first place. Take, for instance Rickets and Scurvy, Vitamin C and D supplements have made these diseases history. The goal is to provide an unhealthy environment for disease and that's exactly what Sango Coral Calcium helps do best. Just as the right nutrition makes an unhealthy environment for scurvy and rickets, the right nutrition can make an unhealthy environment for other diseases. True. Sango Coral Calcium Supplement doesn't contain any vitamins. There are dozens of very valuable vitamins (one of which I highly recommend), in the market place to use in conjunction with Sango Coral Calcium. Minerals are important and unfortunately most mineral supplements have ingredients that are not on the diet. 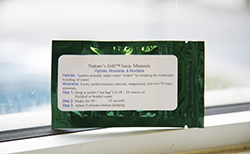 The best source of minerals I know of (diet or no diet) is Nature's Gift™ ionic minerals. It's coral calcium which when added to water release over seventy trace balanced minerals in ionic from. Order 1,2, or 3 packets each month. The following subscribe button is to enroll to have it sent to you automatically on a monthly basis. Pricing includes postage--if outside the U.S. make sure you choose the international option of your choice. You can cancel at any time.